Addis Ababa — Ethiopian Airlines has grounded all B-737-8 MAX jets, following the Ethiopian Airlines plane crash that killed all 157 people on board. 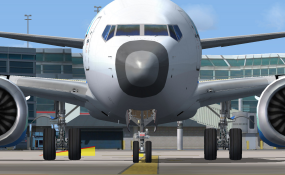 The Airlines has decided to ground all B-737-8 MAX fleet effective March 10, 2019 until further notice. "Although we don't yet know the cause of the accident, we had to decide to ground the particular fleet as extra safety precaution", read the press release that Ethiopian sent to ENA. China has also grounded all Boeing 737 MAX 8 jets, following the Ethiopian Airlines plane of the same model crashed. The Civil Aviation Administration of China said in a statement on Monday morning that all domestic Boeing 737 MAX 8 jets must be out of the air by 6 p.m. local time, due to its principle of "zero tolerance for safety hazards." The Ethiopian Airlines incident was the second time in less than six months that a new Boeing aircraft crashed just minutes into a flight. A Lion Air Boeing 737 MAX 8 flight went down over the Java Sea in late October, killing all 189 people on board. "Given in both air crashes, the aircrafts were newly delivered Boeing 737 MAX 8, and both accidents occurred during the take-off, they share certain similarities," the administration said in a statement. The Ethiopian Airlines flight from Addis Ababa to Nairobi lost contact with authorities shortly after takeoff at 8.44 a.m. local time on Sunday, just minutes after it left Bole International Airport in Addis Ababa. Tewolde GebreMariam, Ethiopian Airlines CEO, said at a press conference Sunday that the pilot had reported technical difficulties and had been given clearance to return to the Ethiopian capital. Tewolde said a routine maintenance check hadn't revealed anything before takeoff. "As it is a fresh incident, we have not been able to determine the cause. As I said, it is a brand new airplane with no technical remarks, flown by a senior pilot and there is no cause that we can attribute at this time," Tewolde said. The identification of the 157 victims who died in the crash was underway on Monday morning, as the country set up a committee to carry out forensic investigation. Bodies of the victims will be delivered to their families and loved ones, once the identities of the deceased are identified. Those who lost their lives come from 35 countries, including 32 were Kenyan, 18 Canadian, 17 Ethiopian, eight passengers each from China, Italy and U.S, seven passengers each from France and Britain, 6 Egyptian, 5 Dutch, 4 UN passports holders and 4 Indians among the others.